GERMANY—beyerdynamic has announced the Asian availability of the ‘fold-away’ versions of its Revoluto conference microphone system. 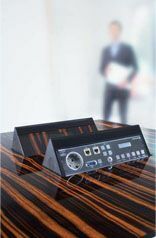 The new mic systems, which made their debut at the ProLight+Sound exhibition earlier this year, are a joint venture between the well-known mic manufacturer and Rosenthal Einrichtung, a 150-year-old German furniture with a tradition of producing bespoke conferencing items. beyerdynamic’s Revoluto conference mics can now be built into bespoke tables. the company can also custom-make units for use in its own tables if required. Various standard versions of the foldaway Revoluto will be available, from simple delegate and chairman units to variants with language selectors, volume controls, displays and voting buttons. All switches take the form of touch-sensitive, capacitive buttons, which are protected by an engraved glass cover, which can also be automatically illuminated when the microphone’s lid is pressed.